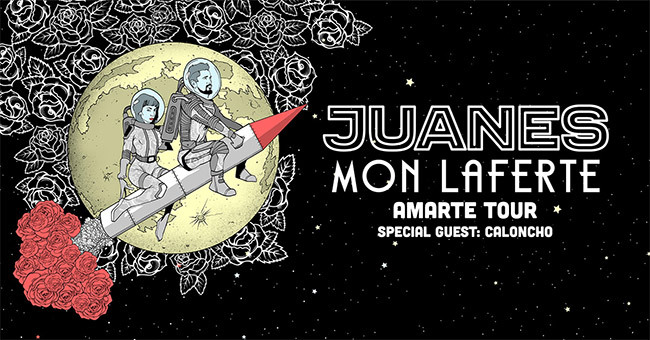 Latin Rock’s leading global ambassador and the most-awarded solo artist in Latin Grammy history, Juanes, has announced the 2018 North American Amarte Tour with Latin Alternative’s new leading-lady Mon Laferte. Produced by Live Nation and also including special guest Caloncho, the tour will kick off April 20th in Orlando, Florida and continue across North America for an additional 15 dates, wrapping May 20th in Temecula, California. Tickets will go on sale to the general public starting Friday, December 8th at LiveNation.com. The tour announcement follows closely behind recent Latin Grammy wins for both artists. Juanes’ critically-praised, and chart-topping Mis Planes Son Amarte (Latin Music’s first major visual album) received two new awards this year, increasing the Colombian superstar’s career tally to a staggering twenty-five combined GRAMMY & Latin Grammy Awards. With a rare five-star Rolling Stone review and pick as “One of the best albums of 2017,” Mis Planes Son Amarte also just earned a 2018 GRAMMY nomination for “Best Latin Pop Album.” Hailed by TIME as “one of the 100 Most-Influential People in the World,” and The New York Times as “Latin America’s soulful poet,” Juanes has built a distinctive sound that fuses his love of rock and pop, with multi-layered songwriting, and a deep reverence for the traditional folk and other indigenous rhythms of the continent. With eight multi-platinum albums to his credit, Juanes has notched eleven No. 1 Billboard singles, and holds multiple chart records. He is also one of Latin music’s leading social media voices and a dedicated global activist, with wide ranging charitable efforts. Mexico City based, Chilean singer-songwriter Mon Laferte is “One of the rising stars of the Latin music world.” Following the release of her new album La Trenza, MTV named Mon Laferte as this year’s Best Artist In Mexico, while NPR, All Music, The New York Times and more have also applauded the album. Most recently, La Trenza, received an impressive five Latin Grammy nominations, with Mon Laferte taking home the award for “Best Alternative Song”- recognizing “Amárrame,” her hit duet with new tour partner Juanes.